IP6 (inositol hexaphosphate, inositol hexakisphosphate, phytic acid) is a phosphorylated form of the pseudovitamin, Inositol. All animals and plants and contain inositol in every single cell and it plays a number of important roles in the body. As a supplement, IP6 is used to support the immune system, promote a positive mood, enhance energy metabolism, and protect the body from oxidative damage and signs of aging. Inositol hexaphosphate is also being researched for the treatment of a number of health conditions, including PCOS, diabetes, ADHD, cancer, bipolar disorder, and Alzheimer’s disease. In addition, an IP6 supplement may reduce risk factors related to heart disease and fatty liver disease by lowering triglycerides and bad cholesterol (LDL) in the blood. IP6 may also naturally lower glucose levels in the blood and help to increase sensitivity to insulin. Further, it has been shown to decrease the secretion of insulin in patients who are insulin-resistant. Inositol derivatives are present in every eukaryotic cell. They are used in part to form the phospholipid bilayers which form cell membranes and provide structural integrity. 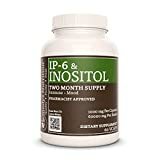 Inositol is also involved in signal transduction as well as a number of cellular functions including migration, apoptosis, regeneration, and more. Inositol is used by the brain and CNS to accommodate efficient secondary neurotransmission. In some research studies, it has been observed to improve cognitive functioning in patients with Alzheimer’s, Parkinson’s. and other conditions of cognitive impairment. One of the largest areas of research interest for IP6 supplements is for cancer prevention and treatment. In animal testing, IP6 has been shown to demonstrate potential activities for combating many of types of cancer including colon, breast, prostate, pancreatic, lung, liver, and blood cancers. IP6 has shown promise as an inhibitor of blood vessel growth in tumors. As tumors grow in the body, they require a blood supply to continue that growth. This creation of new blood vessels is known as angiogenesis. In research trials, IP6 has been seen to have antiangiogenic activity. Research studies have shown that IP6 also helps to restore regular apoptosis (naturally programmed cell death) for cancerous cells in experimental animals. When cancerous cells die off at normal rates, they are significantly less likely to spread and grow to other areas of the body. It is also thought that IP6 supplementation may increase the effectiveness of certain chemotherapy drugs. Additionally, IP6 is thought to make hormonal therapy more effective. To date, no human trials have been conducted on using IP6 for treating cancer, and it is an important area of future research. The research on IP6 has been very promising so far, however more research is still needed to fully understand the effects of IP6 supplements in the body. At this time, IP6 is available as a dietary supplement only. The FDA has not approved IP6 as a drug to prevent or treat any conditions. All forms of inositol are very well tolerated by the human body. In research studies, using an IP6 supplement even at high dosages of up to 12 grams per day has been seen to be safe and without any serious side effects. When side effects do occur, they are almost always mild cases of gastrointestinal upset, headaches, and/or nausea. Dizziness and fatigue have also been reported infrequently. Although IP6 supplements are likely safe for most healthy individuals, there are possibilities for negative drug interactions. IP6 may not react well with prescription medications or herbal agents which slow down the clotting of blood. Combining IP6 capsules or powder with aspirin, ibuprofen, naproxen, diclofenac, dalteparin, enoxaparin, heparin, warfarin, and/or clopidogrel is not recommended. Interactions between IP6 and calcium, iron, and zinc can occur. IP-6 is capable of chelating multivalent metal ions in the gastrointestinal tract, which can form insoluble salts and may decrease mineral absorption. Human breast milk contains small amounts of inositol. This compound can also be found in common food sources such as grains, rise, nuts, seeds, corn, sesame and dried beans. Dosages commonly found in foods are considered safe for pregnant and nursing women. However, there has not been any research into the use of IP6 supplements for these women. It is thought that high doses of inositol may cause uterine contractions. Out of an abundance of caution, it is recommended to avoid supplementing with inositol if you are pregnant or nursing, unless instructed to do so by your doctor. Do not take an IP6 supplement without first consulting with your doctor if you have a clotting or bleeding disorder. Inositol hexaphosphate has the capacity to slow down blood clotting and may exacerbate conditions which are being treated with antiplatelet or anticoagulant medications. If you have anemia (iron deficiency), then you should not use an IP6 supplement. Inositol hexaphosphate binds to available iron in the GI tract and may worsen deficiency symptoms in those with already low levels. If you have osteoporosis or osteopenia, do not use inositol hexaphosphate. IP6 also binds with calcium from food sources in the gastrointestinal tract, and may cause calcium levels to drop too low. Chronically reduced calcium levels may worsen the bone degeneration and weakness associated with bone and joint disorders. If you are scheduled for any surgical procedure within the next three weeks, discontinue use of any IP6 supplements you may be taking currently. IP6 may slow down blood clotting and cause complications during the surgery.